The Ontario Ministry of Agriculture, Food and Rural Affairs (OMAFRA) released its Custom Farmwork Rates Summary for 2018. The report provides compensation rates for 100 field operations from tillage to combining, to chemical application, and is based on results from 200 custom farmwork operators within the province. The 2018 report shows an overall trend of steadily increasing rates, but some operations have seen minor decreases or no change at all. 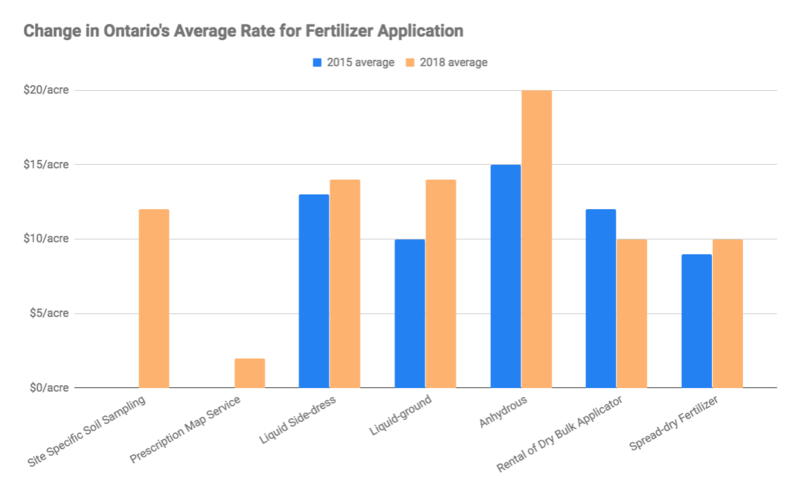 For example, in 2015 and in 2018, the going average rate for an early season application of insecticide or fungicide stayed the same at $10 per acre. However, the provincial average rate for combining corn, soybeans, cereals with a grain buggy saw minor increases, such as increasing to $48 per acre from $44 per acre for combining corn. 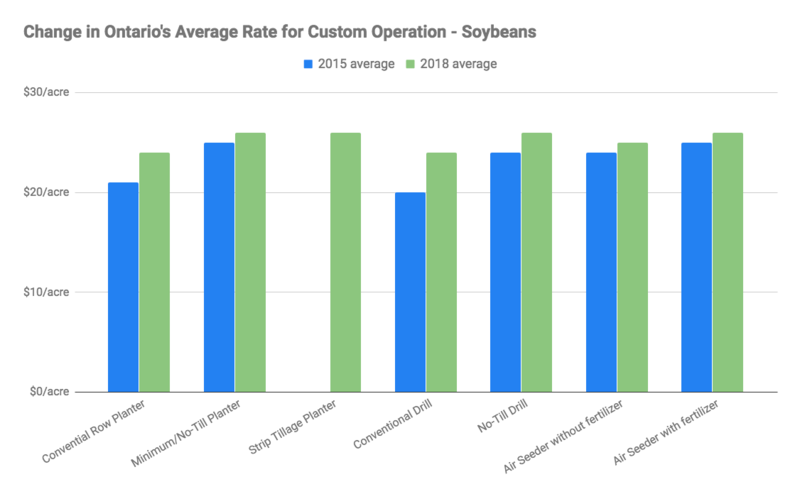 Combining soybeans and cereals also saw minor increases to an average rate of $46 per acre and $45 per acre respectively. The report doesn’t speculate the reasons for the changes, or lack of changes, among rates, but inflation, supply and demand, and rising operational costs (fuel) could all be factors. OMAFRA updates the rate summary report every three years. The provincial average for 2015 and 2018 are listed within the tables when available. Rates are listed as price per acre or price per hour. The report also includes percentiles, representing the lowest and highest part of a range. The average rate usually falls somewhere in between. 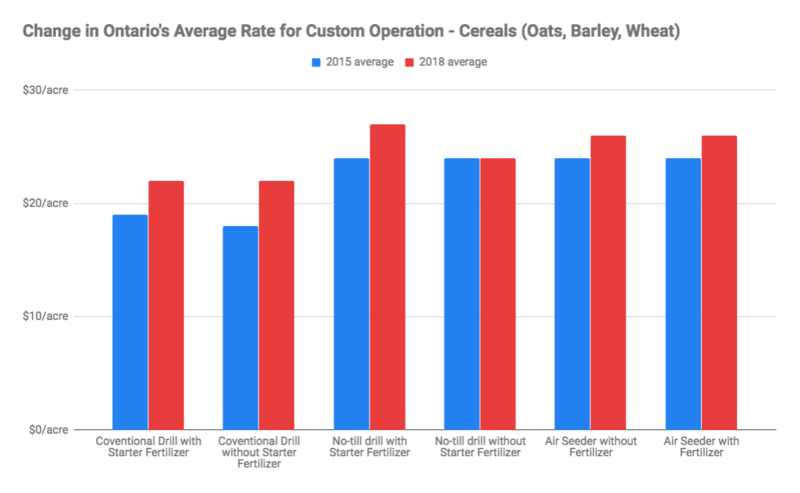 View the full report detailing custom farmwork rate ranges and averages for a variety of field operations in Ontario here.